Kilchberg, July 25, 2017 – The conditions in the first half-year were unchanged and remained difficult for the whole industry. Stagnating or only slightly growing chocolate markets, a consumer sentiment that remained largely restrained and an ever changing trade landscape posed great challenges for the industry. Lindt & Sprüngli however still managed to win market shares in strategically important markets and increased Group sales to CHF 1.549 billion, which corresponds to an organic growth of +3.6%. The strategic realignment of Russell Stover is making progress, but will take more time than originally anticipated. Excluding Russell Stover, a growth of +6.6% can be reported for the first half-year. Given the challenging market conditions, this represents an above-average result and is in line with our medium-/long-term strategic targets. It underlines the essential soundness of Lindt & Sprüngli’s core business that generates approximately 75% of Group sales with the Lindt brand. In the first half-year, Lindt & Sprüngli was once again confronted with stagnating or slow-growing chocolate markets, especially in its most important market, North America, and consumer sentiment that remained largely restrained. Thanks to numerous innovations and excellent point-of-sale presentations, the seasonal business performed very well in the first half-year. Lindt & Sprüngli is once again growing faster than the chocolate market as a whole and was able to gain important market shares. Group sales were increased by +3.1% to CHF 1.549 billion in the first half of the year, which equates to organic growth of +3.6%. Excluding Russell Stover, whose sales are declining due to the strategic realignment in the challenging US chocolate market, Lindt & Sprüngli was able to achieve very good growth of +6.6%. This is within the scope of the medium-/long-term strategic growth target and represents an above-average result, given the challenging background of a globally stagnating chocolate market. At the same time, this result underlines the essential soundness of Lindt & Sprüngli’s core business. Approximately 75% of Group sales are generated by the Lindt brand. The “Europe” segment generated sales of CHF 759.8 million, which represents an organic growth of +6.0%. Despite ongoing shopping tourism in its neighboring countries and the continuing expansion of hard-discount chains, the Swiss domestic market recorded positive sales results. The very good results of the subsidiaries in Germany and the UK – the two largest chocolate markets in Europe – are particularly worth mentioning, as are Austria and Spain, where the increases are in the high single-digit and even double-digit range. Also noteworthy are the positive developments in the recently developed markets, such as the subsidiaries in Russia, Poland and the Czech Republic, which are showing great promise and strong growth rates. The result in the “NAFTA” segment amounted to CHF 558.1 million, which corresponds to an organic decrease of –3.0%. This result was influenced mainly by the strategic realignment of Russell Stover, which is making progress but will take more time than originally anticipated. Following the elimination of non-profitable products, new and innovative concepts were developed to further extend America’s popular traditional chocolate brand. The highly seasonal gift-oriented range is supplemented by products for personal consumption. The relaunch of the sugar-free line – an area in which Russell Stover is the market leader – is planned for the second half of the year. The result in the “NAFTA” segment was additionally influenced by a stagnating overall chocolate market and a changing trade environment. The e-commerce channel is gaining more and more importance, whereas drug stores, which are traditionally important purchasers of chocolate products in America, are following the trend towards “healthy snacking” and thus have restructured their product portfolio. “Thanks to its premium positioning and, in particular, its leading position in products with high cocoa content, Lindt & Sprüngli is very well placed to meet the requirements both of the trade and its consumers”, Dieter Weisskopf, CEO. The two brands Lindt and Ghirardelli were able to grow somewhat faster than the market and were able to further expand their leading position in the premium chocolate segment. Taken together, the three brands Lindt, Ghirardelli and Russell Stover are No. 1 in the premium segment and No. 3 in the US chocolate market as a whole, and thus the Group continues to be well positioned to master future challenges. Worth mentioning is also the double-digit growth of the subsidiary in Canada, supported by very good seasonal sales. In the “Rest of the World” segment, very good progress was made in the emerging markets of Brazil, China, Japan, and South Africa in particular. This shows that the prudent expansion policy of the previous years has proven successful and provides the ideal base for the continued pursuit of this course. In addition, the duty-free and distributor businesses made a strong contribution. The segment’s sales amounted to CHF 230.8 million, which corresponds to a strong organic growth in sales of +14.0%. The Global Retail business remains on the road to success. With over 20 new openings in attractive premium shopping locations in Japan, Canada, and Europe, the dynamic expan­sion rate of the previous years was continued. Thus, the Global Retail network now includes over 390 shops. Numerous new openings are also planned for the second half of the year, so that the target of 30 new stores will be exceeded for the financial year. The focus for 2017 is service training for the retail employees, who are in direct contact with consumers on a daily basis. The prospect of good harvests has led to a decrease in the prices of cocoa beans, compared to the previous year. As is the case for the chocolate industry as a whole, cocoa beans are bought in advance via future contracts to counteract price fluctuations. At the same time, the price of cocoa butter which Lindt & Sprüngli, as a premium producer, uses a relatively large amount of, has declined to a lesser extent. For these reasons, the price reductions for cocoa beans in the market have had only a nominal impact on first-half results. The Lindt & Sprüngli Group’s profits also continued to make good progress in the first half of the year. Operating profit (EBIT) rose to CHF 105.0 million as of 30 June 2017, representing an EBIT-margin increase by 20 bp to +6.8%. The Group’s net income was CHF 76.3 million, corresponding to an increase of +5.7%. 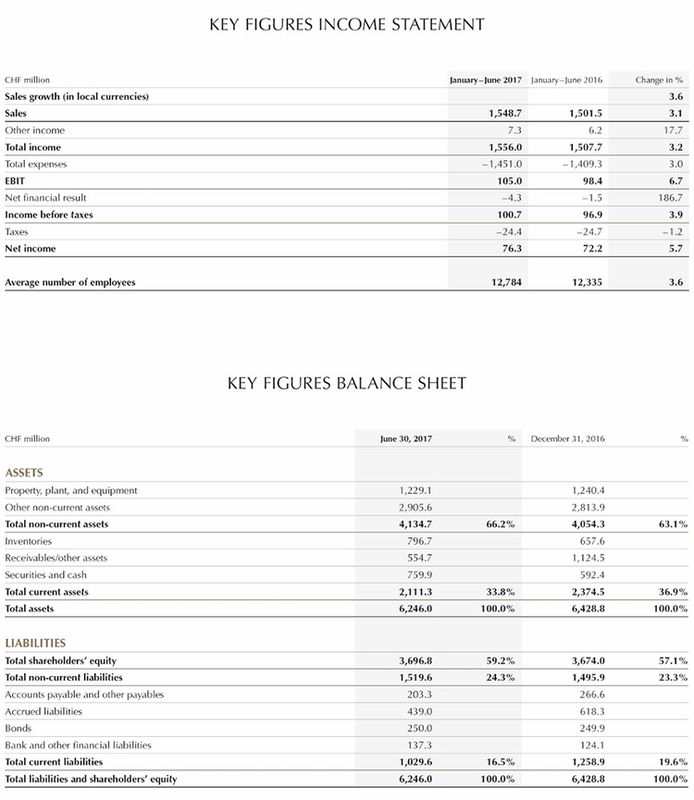 Operational cash flow rose to CHF 343.9 million. Total assets as at 30 June 2017 amounted to CHF 6.246 billion and the equity ratio further increased to very solid 59.2%. The Lindt & Sprüngli Group expects accelerated sales growth in the second half of 2017. Due to current developments in North America, it is anticipated that revenue growth for the full year will be slightly lower than in the previous year, combined with an increase of the operating profit margin. However, the Group is still confident that its growth will considerably exceed the industry average. You will find the semi-annual report 2017 here.